Some weeks past, the Sunday Times carried an article on some great-tasting chinese pastries at Changi Village. It caught my interest as I prefer trying out 'recommended' food sold at nondesript locations. I reason that if people come in droves to such obscure or out-of-the-way places, it must really attest to the quality of the food. So a week later when I happened to be in the vicinity, I popped by the confectionary which was just a simple stall housed in the Changi Village hawker centre. There was an interesting array of goodies laid out on the shelves. My original intention was just to buy some tau sar piah (bean paste pastry) and lau po bing (wife cake) since these were the perennial favourites in my family. Eventually though, I ended up buying some pineapple sponge cakes, tapioca cakes, lau po bing (wife cake) and tau sar piah (bean paste pastry). Tapioca Cake : It was cut into a large triangular piece and generously thick. It was chewy with a slightly crusty top layer. Good, I will eat it again. Tau Sar Piah : Hmm.....the outer skin was just nice, not too thick to give a floury sensation. Fragrant mung bean filling was tightly compacted into the centre of each piece. It was a hit with my parents who are incidentally, highly critical of what they eat. The lau po bing and pineapple sponge cakes were not too bad but not something that would make me go back just for them alone. But I will return for the tau sar piah! I stepped into the Gym! I am embarrassed to say that thus far, I have NEVER stepped into a gym. Yes, I can imagine the incredulous looks I am drawing from all those I-visit-the-gym-thrice-a-week people out there. I am going to further horrify even you, the average reader, by confessing that I cannot even remember the last time I really exercised. Unless of course, you consider those half-hearted attempts to do some briskwalking up Bukit Timah hill once in a year.....or those few laps that I swim when I feel like it.....or the time I spent chasing my sons round the playground, as exercise. My fittest form would have been during my junior college days. I was in the Outdoor Activities Club then and as part of endurance training, we were made to run up and down the hilly streets behind my school for hours on end. Training in a group was fun as we paced and encouraged one another. Sadly, exercise featured less prominently on my calendar once I entered university where other more fun activities existed. And when marriage and subsequently motherhood beckoned, exercise was relegated to the bottom of my To-Do list. Well, I decided to change all that. One of my new year's goal is to take good care of myself - both internally and externally. I took a honest close look at myself in the mirror and decided that although I may not be fat nor ugly, I can do with improvements. I am not talking about going down the route of plastic surgery to improve one's looks. Instead, I am suddenly more aware that as a woman grows older, her health becomes that much more of a precious entity. I certainly can change my health habits. For starters, I have decided to begin following a strict exercise routine in my estate's gym. For someone who had never been into a gym, much less use the equipment in there, the first visit to the gym was intimidating. The array of machines and their controls can be mindbloggling to a gym virgin like me. I started with the threadmill as it looks simple enough. After fiddling with the settings, I embarked on a 20 minute run/jog. It was not too bad, I lived. Next, I decided to be brave and attempt to use this. Then I realised, it's not switched on. Now where is the power switch?.....Finally I decided to ask another lady and was told that it switches on automatically when I start pedalling. Apparently it runs on kinetic energy. I felt foolish but nevertheless tried to remain cool. Hmm...it gives an oomph to the workout, I like it. After 20 minutes, I stepped off and called it a day. That was three days ago. 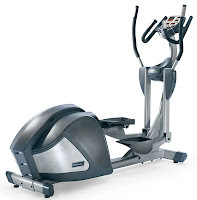 I have since found out the above is called an elliptical. Over the past three days, I have been to the gym daily and averaged workouts of 40 minutes, burning off 230 calories. Peanuts to more seasoned gym-goers I believe, but at least a start for me. I bought this from jones the grocer at Dempsey Hill on Saturday. The generous proportion of dried fruits to muesli was mainly what attracted me to it. The ingredient list includes an interesting mix of oats, wheat, sunflower, coconut, almonds, sultanas, paw paw, apples, apricots, wheat bran and millet. Hubby and I had it for breakfast this morning. The toasted muesli was fragrant with a nice crunch to it, not too dry and hard. However, the mixed dried fruits were too sweet for my liking. Or perhaps the high fruits to cereal ratio made the serving overall sweeter. I prefer my breakfast cereals unsweetened; I even eat cooked oats plain, on its own. Maybe I should stick to plain cereals next time and just add raisins or other fruits on my own. I read numerous glowing reviews of the Cellnique Pro-series Pro Sebum Gel extoling its ability to clear blackheads and whiteheads. It has a dual function of clearing both clogged pores and reducing oiliness. In mose cases, satisfying results have been achieved within two weeks. The box also proclaims a money-back guarantee otherwise. The mere mention of blackheads brings back unpleasant memories of painful extraction sessions at the hands of my facial lady. I vividly remember vain attempts to endure and not grimace nor tear reflexibly from the sheer agony that I can definitely do without. A close scrutiny of my face reveals the presence of some tiny blackheads and enlarged pores at the nose region. Definitely not the most ideal complexion. So with much anticipation, I bought a bottle of the Cellnique Pro Sebum Gel and tried it out last night. Results and my verdict? Akan datang in two weeks' time. Watch this space for updates! Oops! I forgot to come back to post my review on this product. I could see visible results in less than 2 weeks. My nose was clearer with less black heads. However after the initial 2 months, the Pro Sebum Gel seem not to be having any further effect on my skin. "Do you know why we celebrate Good Friday and Easter?" I asked Big Buddy over lunch yesterday. "Huh?" was his reply. So I ventured to explain how Jesus loves us so much as to die for all of us on the cross and how He then rose from the dead three days later on Easter Sunday. To ascertain if he understood what I had said, I asked "Where is Jesus?" "On the cross" Big Buddy said. "Well, Jesus died on the cross but because He is alive now, He is in heaven. And if you love Jesus, you can also ask Him to come into your heart." I was trying to share Christ to my son! "Do you love Jesus?" "OK, so can Jesus come and stay in your heart?" "So where is Jesus now?" "In my heart" came the reply. I realise with all probability that Big Buddy may not fully comprehend what had transpired in this short conversation. It is sometimes a challenge to share in a manner understandable to a young child. However, I choose to believe that I had deposited some Christian truths in his heart. Hubby and I are fully convinced that as Christian parents, our sons should be brought up according to God's ways and this includes talking to them about God. While we are thankful and grateful to school and nursery teachers in church who share God's word and values with them, we recognise that ultimately, it is our sole reponsibility. Today, I asked Big Buddy again. "Where is Jesus?". "In my heart" was his reply. Hubby just came home from his business trip to USA with lots of pressies. He brought back heaps of clothing from Gap, Polo Ralph Lauren and Adidas for the family. I must say that Hubby has good enough sense when it comes to fashion. Most of the time, I trust him enough to steer clear from buying something that I will hesitate to wear or carry. This time round...Yes, he bought the OPI polishes I had requested for in my earlier entry. In addition, he surprised me with not one, not two but THREE Coach bags! Little Buddy is proving himself to be very adept at picking up new words. His vocabulary expands at a rate of 2-3 new words every other day. He seems to have a healthy curiosity towards people and things around him. He likes to point at an interesting object or picture while asking in a lilting voice "What that?". If he deems the answer interesting enough, he will deign to repeat the word after you. We notice too that he listens to what people around him are saying, sometimes even without your knowledge. He might be playing nearby, seemingly engrossed in his toys but many times, he surprised us by suddenly uttering a word that someone had just spoken. His first spoken word is DUCK at 15 months, followed by his first two-syllable word RABBIT on the same day. These were some toys that he played with at that age. Then two days thereafter, he started asking for his favourite fruit BU-BERRY (blueberry) which is his first three-syllable word. He quickly progressed on to others like BREAD, BOOK, BABY and even embarked on two-word phrases such as NO MORE and KEEP IT till by Christmas 2007, he was wishing our relatives and friends MERRY CHRISTMAS. At home, although our dominant language is English, we also speak a smattering of Mandarin at times to expose our sons to the language. Little Buddy spoke his first Chinese word 花 at 17 months and this was followed by a two-word phrase 再见 at almost 10 months. Since then, it has been full speed ahead for Little Buddy. We do not adopt any recommended teaching method per se, choosing instead to cater to Little Buddy's natural curiosity and desire to learn. We take time to introduce new things to him, saying the word for them and having fun at the same time. We do not use babytalk with our children but consiously speak using proper adult language at all times even when they were infants. Little Buddy now has a vocabulary of about 200 words and is starting to speak in phrases. He sings to himself as he plays with an almost funny mixture of words and sounds to a self-made-up tune. Watching him at play can be quite entertaining. Today marks another milestone. He uttered his first sentence - "Jie Jie sit in bus" when he saw a picture of a girl in a school bus. Although the sentence is grammatically incorrect, I am just so amazed at his pace of language development. Future worship leader in the making? I think Big Buddy has an inherent love for music. He loves to sing and often hums along to his own rhythms. He makes up his own songs and sings them at the top of his voice. Today, he decided to add a whole new dimension to his performances. He found Daddy's plectrum (guitar pick) and proceeded to 'play' an imaginary guitar with his left arm extended while 'strumming' away with his right hand holding the plectrum. He was singing a song at the top of his voice. Initially I could hardly make out the words he was singing but I found the rhythm and snatches of the song vaguely familiar. Then I realised with much surprise that he was singing the chorus of "You Are My All in All" - one of my favourite Christian worship songs! Little Buddy was watching him and soon joined his brother, singing 'Jesus' at all the appropriate invtervals. I am so happy to see how his teachers have deposited something in my son. Hubby and I chose to send our children to a Christian kindergarten for the reason that we want our children to be brought up in a Christ-centred environment as much as possible. When Big Buddy was younger, my mother bought him a Japanese sailor suit. He looked so cute in it that I kept it. I took it out the other day and decided to dress Little Buddy in it. He looked pretty smart and I could not resist taking a photo shot of him. When will he start building something? There are plenty of construction toys at home ranging from Duplo sets and various themed Lego sets to wooden blocks (both natural and coloured ones). We bought some but most were either gifts from relatives and friends or toys that my brother and I played with when we were young. I guess the main strategy of such toys is to encourage children to demonstrate their inate creativity while developing their fine motor skills. So we happily brought out the baby Duplo sets for Big Buddy to play with when he was past his first birthday. Of course, we did not expect him to start building aeroplanes, grand castles and the like. We thought it would be reasonable for him to sit down and perhaps start attempting to stack those large clourful pieces. However, to our dismay, Big Buddy displayed nary an ounce of interest in Duplo set. He proceeded to upturn the bucket, dumped all the building pieces on the floor and sent every piece flying to all parts of the living room with wide sweeps of his hands. I remembered checking the appropriate age stated on the set just in case Big Buddy was still too young to know how to play with the toy properly. No, it was clearly written 1-3 years. With a sigh, we packed them all up, determined to perhaps introduce it again some time later. We brought the Duplo again a couple of months later but yet again, Big Buddy displayed the same response. He resisted doing any simple stacking, let alone building. He was happy to just bash the pieces around. We gave up and thought that Big Buddy was more of a destroyer than a constructor. A book that I read informed that the specified age on the some toys does not necessarily refer to the age at which children are expected to know how to play properly with is. Sometimes it indicates the age at which the toy is safe for. Some friends also told us that how children play with their toys also depends largely on their character and likes/dislikes. Every child is different, each will develop at his own pace and not all will play with the same toy in the same manner even at the same age. I was comforted but since those days, I loathed to bring out any construction toys for Big Buddy even though he would sometimes beseech us to do so. All this came to a sudden change when he started school this year. Perhaps it was due to peer pressure or from seeing how his friends at school played with those toys. Big Buddy actually started building something with those building pieces. Simple structures but nevertheless, wonderful achievements from a boy who used to just sweep them all over the room.